Whilst I am showing my films over the Winter period people readily tell me of some of the nests that they have found during the breeding season.Some promise faithfully to give me a ring if a certain birds breeds again so I can come and photograph it. Usually the phone does not ring but this year, knowing that I needed to film a Nightjar for the next Pennine DVD, I was invited to a nest where the female was brooding two small young. 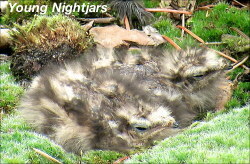 It was exactly forty years since I last saw a Nightjar’s nest so it was a long overdue experience and will be in this year’s DVD. When I started filming birds more than forty years ago if you wanted to film a nest you had to put up a hide. Times have changed and much of my photography is now done from under a large camouflage cloth that used to cover an army tank! When you are under the cloth you have to sit very still as any movement, however small, can be seen by the bird you are filming. During the week, whilst sat still waiting for a Kingfisher a male Sparrowhawk flew over the stream and clipped my head with its wing. The funniest event I have ever experienced under the cloth was on Islay when I was sat still waiting for a Corncrake to appear. Suddenly a Song Thrush landed on my head with a snail. It proceeded to try and crack the snail by hammering it on my skull. A painful experience!! On Hopwood the Roe Deer have produced two fawns this year, which is good news. Even better has been the re-appearance of Partridges, which have not been seen for at least five years. They have probably failed to breed with the rains but perhaps next year they may be more successful?